Feel free to share the file/differences - there's certainly some room for improvement here. Modified controller is in my concorde git repository. As we don't use the ND in FGDATA (because that one is much less developed, and much less realistic), so that is. I will get it fixed sometime, but have your patience. Don't worry, my patience is good and I have workaround described in previous posts. BTW, I am not dead, I am worse sick and not able to develop much at the moment. Assuming I get better, development will be resumed if possible. I have redesigned the error system, it should give you more useful information, as to the cause of an error. To people complaining about gear not working: This is likely due to someone using an old version of the aircraft, before I fixed the multiplayer stuff. I am not able to duplicate any reports of this error on my test machines. Development is severely slowed or stopped at the moment due to personal reasons. It will continue when/if possible. Thank you for your continued support. Its due to nasal errors of some sort or something like that. Don't remember. When you got to another airport, it stops erroring, and even if you go back to the default, it works fine. Working code stops working for no known reason, then starts working once you leave the default airport. 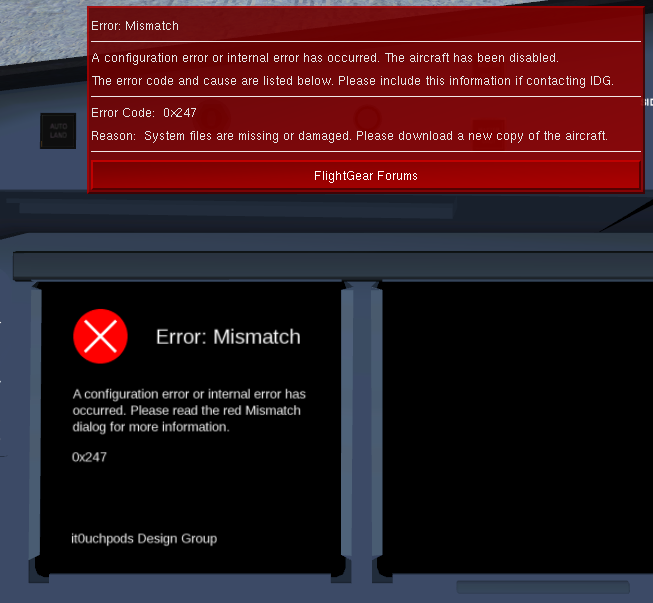 Since the code stops working, several files fail to load, so you get a Mismatch error (247). Yep. We try to find the cause if possible. However, continuing to fly with these files (FADEC, and libraries most affected), could cause big problems, so I started checking for files (like classroom attendance list). If any is missing or not fully loaded (so, parsed with no errors), you will get a Mismatch (247).